RockUnitedReviews: LOVEBLAST: "Hard Liquor In Big Glasses"
LOVEBLAST's thunderous sophomore EP release is a throwback to the golden era of U.S. melodic hardrock with a modern touch of Avenged Sevenfold. The motley crew (no pun intended... or?) led by singer Brian Durbin - a man boasting a rich voice somewhere between Seb Bach (Skid Row) and Ted Poley (Danger Danger), and with a certain star quality I may add, specialise in hard hitting numbers with plenty of melody and hooks. They are retro without sounding like one of those lame spoof eighties acts. Each song on their five-track EP is an individual chapter of raw attitude and passion, and yet part of the same rock n roll story. 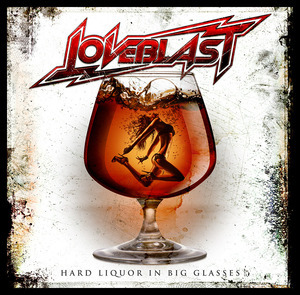 The main idea is however to cram Loveblast down everybody's throat, and they're doing it with "Hard Liquor In Big Glasses". Opening track takes a couple of spins to really appreciate as it's not quite as instantly catchy as the other four (In Your Arms Tonight. Rain On Me. Hard Liquor In Big Glasses. When We Were Young). The EP really gets going with the following track, second song in, and it's all about catchy hooks and bombastic guitar rock from this point on. Simultaneously old fashioned and cutting edge with lots of fun moments as they've captured the feel of yesterdays Skid Row and Danger Danger with todays Avenged Sevenfold. The act SPV/Steamhammer should sign up instead of posers such as Rebellious Spirit. Recommended.